the advent of autumn allows me to better exercise my take on islay's birdlife, a popular attraction to the island all-year round, but particularly at this time when thousands of geese nip south for the winter from greenland. though the population of said birdage is apparently suffering a cyclical decrease, it is still possible to witness huge numbers overhead in their trademark 'v' formation, moving from one feeding ground to another. it's the principal reason why the velo club wears helmets. when i moved here almost three decades ago, i figured it was incumbent on me, as a newbie, to learn to identify each and every bird that i might encounter along the way. disappointingly, though the observer's book of birds is quite explicit in its differentiations and illustrations, almost all the birds amongst its contents looked pretty much identical when seen in their natural habitat. therefore, i have evolved my own categorisation; there are geese and not geese, knowledge that will get you through any seven day visit to the isle between now and next may. however, should you be more ornithologically inclined than yours truly, the ideal way to see more than you ever thought possible would be to contact my friend, gary turnbull. an experienced twitcher, as i believe is the correct terminology, and proprietor of wild islay birding, gary is well-placed to educate the civilian population to the contrary and inadequacy of my own view of the subject. i mention this because gary was sat in debbie's last sunday lunchtime as the bedraggled peloton dragged itself in from the cold, partaking of a coffee and a rather tasty looking toasted sandwich, with his monogrammed minibus sitting outside. we had headed out optimistically at the witching hour of 10am into the teeth of a rising galeforce wind, one which bore the portent of rain at almost precisely the time specified by the forecast. judging by the apparel on display, most of us had raided the winter portions of our cycling wardrobes in anticipation of being the very embodiment of velominati's rule nine. as it happens that is precisely what transpired. though not waterproof, i had taken advantage of endura's latest pro sl biblongs (as livingston likes to call them), or bibtights to you and i. never a truer word was spoken by endura's product director, pamela barclay when she stated "Our Scottish heritage has always left us ideally placed to produce weather-defeating garments." this particular garment features wind-defeating panels on the front, accompanied by a cosy, thin fleecy lining to garner benefit from having pushed aside an atlantic gale. 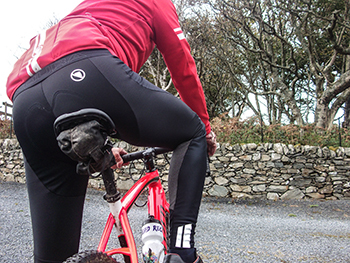 additionally, endura have extended the windproofing round the back of the thighs, helping to resist road spray, a feature that works remarkaby well. 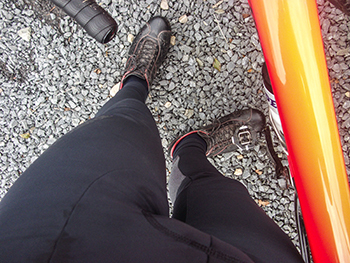 were that thought insufficient, there are reflective panels on the calves to ensure visibility of a darkened evening. the pro sl bibs come highly recommended by vuelta winner, nairo quintana, though perhaps less for their weatherproofing as for the apparently unique variable pad width, previously only available in the pro sl bibshorts. 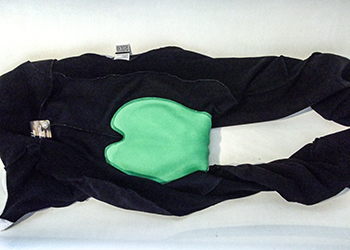 this aspect offer a choice of narrow, medium and wide pads depending on the perceived size of your posterior. 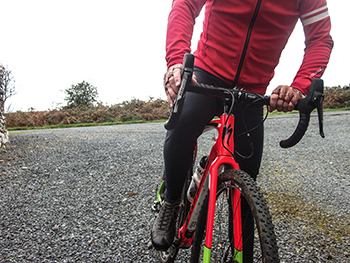 should you be consciously unaware of this particular dimension, each authorised endura dealer is equipped with a saddle-like device that will alert you to which option to choose. 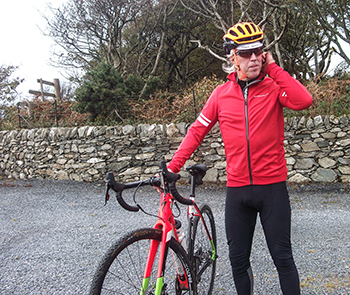 though islay has a fellow like gary to point out the wonders of hebridean birdlife, we are totally bereft of an endura dealer, so in my case, i guessed. at least the evidence of a series of pro sl clad rides would tend to suggest so. however, in all honesty, i'd really have need of wearing the medium and wide options just for comparison's sake. but on the basis that my bicycle rides on either a brooks cambium carved or the specialized saddle atop their crux elite have given no cause for adverse comment, i think it safe to say that endura have our backsides well covered (if you see what i mean). as one ideally placed to judge the efficacy of any proposed windproofing, i can testify that these are pretty much as good as it gets. in the reasonably mild temperatures still inflicted upon the hebrides, i cannot deny that there were occasions when i felt just a tad overdressed, but that augurs particularly well when the mercury no longer rises. and from the point of view of requiring to take a natural break, the admirably low, square-section front panel features an easily manipulated zip. as well as specifying the narrow width pad, i opted for the small-size pro sl, subsequently experiencing no red grooves on my shoulders when heading for the shower. on leaving for home into ten kilometres of galeforce headwind, we did consider asking birding gary to drive ahead of us with the rear door of the bus wide open on the pretence of motor-pacing, but with the thought that he might be inclined to point out itinerant birdlife along the way, we decided to keep the suggestion to ourselves. thankfully, i have it on good authority that no amount of windproofing will devalue the effect of rule #nine. endura's pro sl biblongs are available in sizes ranging from smal to xxl with three pad widths: narrow (green pad), medium (red pad) and wide (blue pad). retail price is £139.99.